Publishing is at a crossroads on a variety of levels, including the possibilities of social media, the effect digital publishing has on commissioning new content, and how the latest innovations in book production processes can make content more readily accessible. 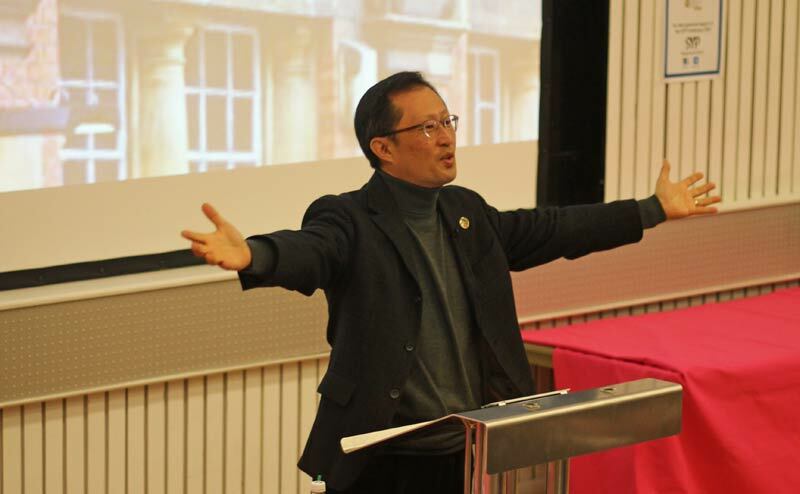 Helping young professionals anticipate these changes and develop the skills they would need for the future was the theme of the 2013 Society of Young Publishers Conference, held November 23 at Oxford Brookes University. 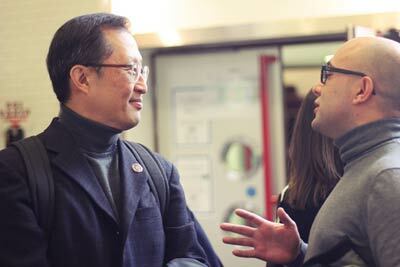 The event drew over 200 delegates from across the UK and featured speakers from as far away as California. Change has, and will, remain a part of the conversation that book publishers are having among themselves. Publishing's future depends on it, and the younger workforce has to be involved in that conversation. The conference has always aimed to remove the barriers between today's key decision-makers in publishing and its workforce. A workforce that is better informed, more equipped for making quick decisions, and supported by those that have come before them will be more confident to experiment with new business models even with failure as a possibility. Over the course of an hour, Chi discussed the publishing landscape through what he called the "10 e's of publishing." "There are a lot of things that come to mind when you think about how publishing has really changed over the past decade especially — most of them because of technology," he said. Chi warned the audience not to "dwell too much on the letter e for electronic book, because that electronic book may end up having a different letter in front," briefly diverging to highlight a change currently underway in some sectors of the industry. Chi then hit upon his next three e's in publishing in quick succession: excessive, easy and expansive. "Today more content is available than ever," Chi said, pointing out that this is not only in the information age but also the age of "excess" content. With over 4.2 million individual titles available in the UK, the explosion of content has been fed by an increase of re-prints and on-demand books, particularly public domain works, self-published works and micro-niche publishing. With so much content available online, readers might believe that they ought to pay less for that content, but "this undervalues the hard work that authors and publishers put in, and the value-add that we create," Chi explained. This risk of being undervalued also gives rise to another common misunderstanding: that e-books are "easy" to create. In today's world, consumers expect content to be easy to find and easy to access. Every e-book should be available for instantaneous download, on any device … anywhere in the world, no matter where you're sitting — and quickly. These are a demanding set of expectations to deliver on. Chi compared this challenge to a race for publishers "where the finish line continues to move away from (us)," adding that "we still have a while to go before everything about e-books becomes easy." It can be easy to assume that e-books are less work for publishers because there is no printing or shipping involved, but "they are hard to make; e-books' creation is more work for publishers." Chi went on to describe the next e: how the role of the publisher continues to "expand" in a number of ways—even if some services are becoming obsolete. "In the past we just created one product," Chi said. "Today we need to make lots of technical investments." To meet these new needs, publishing houses are now hiring engineers, web designers, legal and policy experts, and social media gurus. Meanwhile, as the volume of content managed by publishers has grown larger and increasingly complex, traditional roles in editorial, production and distribution have evolved but not evaporated. "Print books have not completely disappeared," Chi said. "So publishers are still doing everything we have always done." 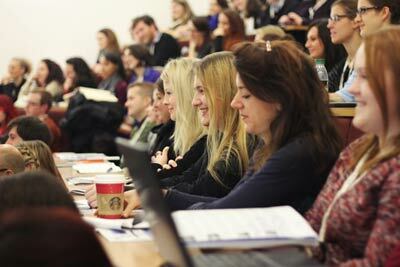 This was an area of particular interest to the audience of young professionals. "These are all the core roles that you have been doing, and no matter what the format is, they aren't going away." There is still a lot of uncertainty, however, and to tackle this, Chi began to wrap up with some thoughts covering the final e's: experimental, experiential, ephemeral and eternal. Publishers need to "experiment" by thinking of new ways to monetize their content beyond the sale in a traditional format. We have agile publishing, we have subscription model, we have freemium… all sorts of different business models are being tested. At the same time, books will be more "experiential": they can "incorporate different kinds of media, or even employ nonlinear storytelling," Chi said. "Readers are just one click away from the rest of the world. This has huge implications for connectivity and social integration of reading, and for how we experience reading." The only thing that is certain, Chi concluded, is the "ephemeral" nature of the industry: "Everything is going to change. This change is threatening and is challenging, as all big change is," he explained. "But this change is also thrilling in the myriad possibilities it presents. The Internet and the digital economy are not threats—they are opportunities." Without a doubt the impact of all these e's will take time to measure, and while some will not be realized by every publishing company, it is an exciting time to be in publishing. Chi urged the audience to experiment, embrace change, and be prepared to fail as they try out new technologies and business models. While the adoption of new technology in some corners is being considered the panacea to book publishing's future, physical bookselling tells a different story in how that profession has adapted to technological shifts over time. As the number of booksellers online grows in answer to the dominance of Amazon, replicating the in-store experience online, and being able to offer the same discounts are perhaps two of the biggest challenges being faced; not every bookseller can compete. The future of bookselling may look uncertain as the overall number of retail spaces shrinks, and bookstores close, but that doesn't mean the in-store experience and online bookstore debate has ended. 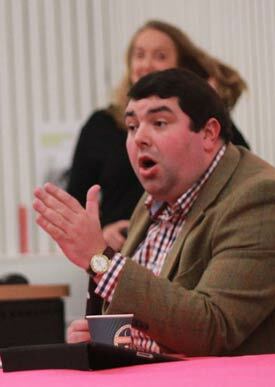 "Publishing and bookselling are one in the same thing," Matthew Cashmore, Digital Director of Blackwell's Bookshop, stated at the beginning of the closing debate on the future of bookselling. "And what we have to be very, very careful of is that it's very easy for us, as an industry, to say change equals technology. Change does not equal technology." Using the analogy of a dog sled (the industry) powered by its huskies (the technology), Cashmore pointed out that change can only happen if you have the right combination of technological tools running in front of your business. With the correct level of alignment, these "huskies" will pull your business forward and your business may succeed. "But if you have a bunch of huskies who don't know what the hell they are doing," he added, "then it's going to turn your business over." Technology amplifies communication, to which there is a positive and negative side to, Cashmore explained. "Digital amplifies what you're good at, and what you're bad at … And business now has to reflect the passion of the people that are in it." "Demonstrate your passion," he said. "There is not an employer, a publisher, nor a bookseller in this industry who is not now starting to recruit for culture and train for competency." Cashmore sought to reassure the audience that the future of bookselling isn't in such a bad position after all. Pulling in examples from the radio, television and music industries, the booksellers' response to technological shifts has demonstrated that they are enterprising people, he added. Given the fact that bookselling's history extends as far back as the 15th Century, it has successfully adapted to the introduction of new technology over time and will continue to do so. Bookselling is not dead, it will survive, and there is nothing different in the introduction of online retailers, including Amazon, Kobo and Google, when compared to the introduction of the printing press to bookselling. Alex Ingram, founder of Pages and Screens, and formerly of Apple iBooks and Waterstone's Booksellers in the UK, spoke more directly about the space that the future of online bookselling might occupy. When we talk about the future of bookselling, there are two things to bear in mind: that bookselling is not just selling and it probably shouldn't be just books … Publishing and bookselling are distinct and that is actually very important. But the boundaries are shifting. There are three prominent narratives currently working against the book trade, Ingram said: Amazon dominance, the death of print, and the death of bookshops. These narratives are incredibly unhelpful, he said, and takes the attention of the industry away from the wider effects in the industry from closures of a bookshop: the loss of book knowledge within both chain stores and independents. The loss of this knowledge for bookselling is one thing both publishers and readers need to care about. "The point is that we've got to think about how we get books into people's hands … Now that could see booksellers behaving a bit more like publishers," Ingram said. "Publishers have largely used other people's tools to get books into people's hands. There is not necessarily anything wrong about booksellers using that methodology in the future … Being first is not what matters in the long run, nor is it what matters in the business." Is there a future for bookselling? Yes. Is it entirely digital? No. Have the new entrants changed it? Yes. Be authentic and demonstrate your passion. Learn about the commercial side of the business. Know that everyone else in the business is figuring it out as they go along too. 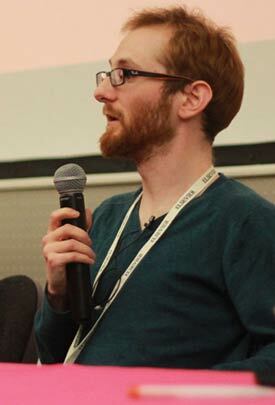 Jonathan Davis (@canadiancat) is a Multimedia Producer in Elsevier's Oxford office and organized this year's SYP Conference. At Elsevier, he oversees the development of a variety of digital products. On social media, you can find him sharing his thoughts on publishing, posting pictures on Instagram and obsessing over his true passion road cycling. That is, of course, when he's not out on the road or in the velodrome, going quickly round and round in circles.